The Society - through its Light-Pollution Abatement (LPA) Committee - recognises individuals, citizen groups, businesses and communities who adopt responsible and environmentally sensitive approaches to outdoor lighting. 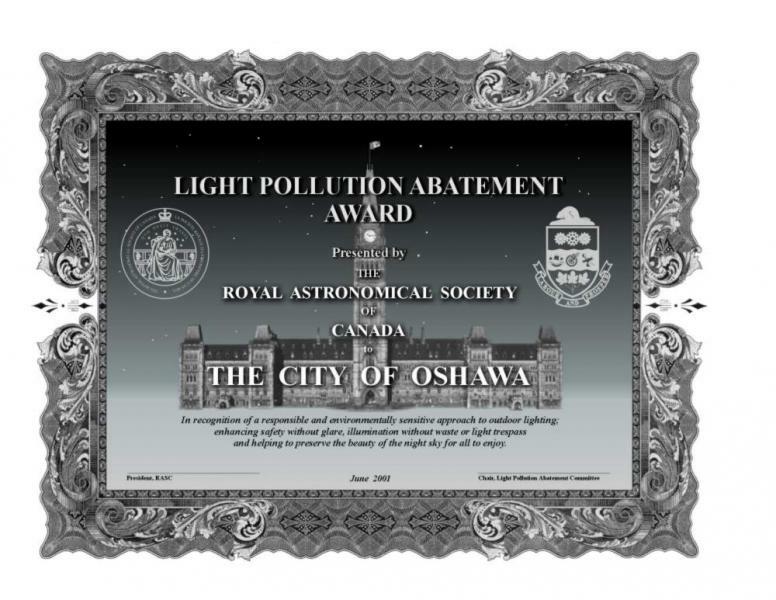 The tangible form of this recognition is the award of the RASC Light Pollution Abatement Program's Certificate of Merit. Certificates are presented at the RASC's General Assembly or other suitable venue anywhere in Canada. The RASC Light Pollution Abatement Award recognizes organizations in Canada that have demonstrated leadership in the promotion of improved lighting practice through their activities in reducing glare, light trespass and artificial sky glow.The award will be given from time to time, as determined by the RASC LPA Committee, to organizations (business, government, institution or citizen groups) anywhere in Canada. Nominations for the award shall be submitted to the RASC LPA Committee on or before January 31 of the year it is to be awarded. More than one award may be given based on the merit of nominations received. Shall identify the organisation, departments and individuals responsible for the initiative. The Light Pollution Certificate shall be awarded to a representative of the recognised organisation at the RASC Annual Meeting or other suitable venue. We encourage the RASC and award recipient to maximise media coverage to further the goal of light pollution abatement.